Mexican pico de gallo gets a refresh with the addition of watermelon in this zippy recipe. The sweet-savory watermelon salsa is served with pan-fried white fish that's been marinated in fresh herbs and olive oil for super flavorful filets. The refreshing dish is ready in under 30 minutes, making it ideal for weeknight meals. Plus, it's good for you—the fish is Whole 30-approved, gluten and dairy free, and high in omega-3 fatty acids. Watermelon is a great source of multiple vitamins and minerals, especially heart-healthy lycopene. Tasty and healthy—what's not to love? The watermelon salsa can be adapted to use whatever melon or fruit is best in season. Try it with mango, citrus, or even berries! It's also delicious with peaches in the summer. For stronger flavor, try this fish preparation with salmon, scallops or shrimp. Per Serving: 639 calories; 22g fat; 19.6g carbohydrates; 88g protein; 275mg cholesterol; 799mg sodium. 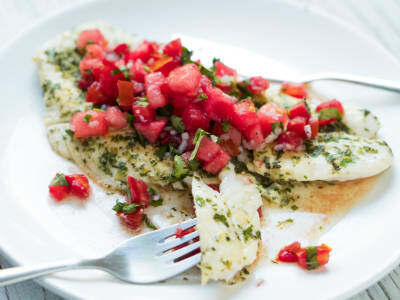 I really enjoyed this recipe, the seasoning on the fish was very good and the watermelon salsa was superb. If you have a thicker piece of fish I recommend slicing it in half so its nice and thin for easy cooking. I used wild cod, but I am a big fan of sea bass so will use that next time. I really, really loved this watermelon salsa. Like the other reviewers said, just remember to keep an eye on your fish and cook it according to how thick it is - it might need more than 3 minutes, it might need less! This marinade made the fish incredibly flavorful - I used really high quality swordfish, but I can see how this marinade and salsa duo would also make any ole inexpensive piece of white fish sing. Loved this recipe. I am not a big fan of super spicy foods so was worried about the jalepeno in the watermlon salsa but it just added flavor! I did end up one of the thicker pieces of my fish about 6 minutes per side to ensure it was cooked through. My husband absolutely loved this dish and raved about the flavor. Perfect for a summer night. Nice and light! I adapted this recipe and did a mango salsa instead of watermelon, and paired it with cod. We did the fish on the grill with superb results. I definitely would make this again.